by Ann Chadwick, Amy Cochrane, Margot Douglas, Chantelle Fisher, Lisa Gaze, Catherine Large, Bibi Locke, Andrew Lowrie, Christine O’Reilly, Kate Allbon Sargeant, Rebecca Ward and Susie Woodhouse. 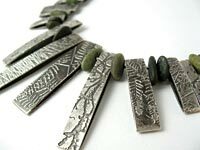 2010, etched sterling silver and pebbles. Courtesy of the artist.